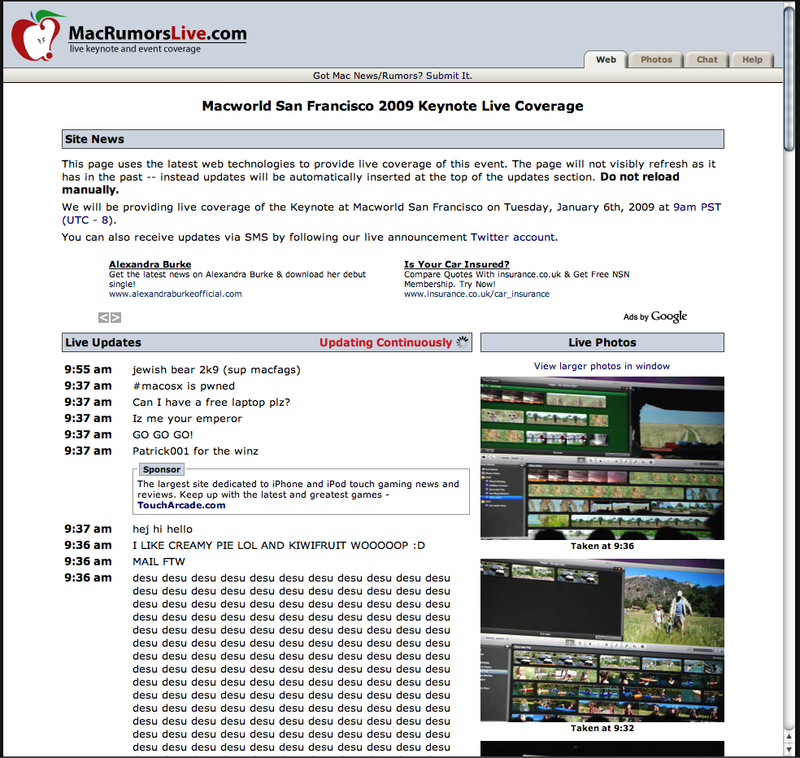 So, Macworld SF 2009 Keynote, where was the iPhone Shuffle!?!!? Devastated. Oh well, I thought I’d point out some of the highlights of the announcements, at least the things I picked up from following various live bloggings of the event! So I guess it’s kind of a live-blog of live-blogging! I’ll possibly write some more at a later date if there’s anything that really grabs my interest. Facial recognition tagging support and syncing with Facebook and Flickr. Any photos that get tagged on Facebook will sync back the tags into iPhoto, I think my wife is going to like that feature as she is a major Facebook image uploader. I was one of those people who liked the iMovie ’08 already, but this new version of iMovie seems to provide all the missing features that people were looking for. The new version was demoed by Randy Ubillos who was the guy who re-engineered iMovie in the first place, I hadn’t realised that he was actually the original creator of Adobe Premiere. So I guess this proves he knows his stuff. The ‘Learn to play’ feature looks pretty cool. There are lessons for both keyboard and guitar from popular artists like Sting, Nora Jones and Fall Out Boy. As my daughter just got a guitar for Christmas I think that will be pretty useful. There are 9 free lessons included and you can buy more via a built-in store in Garageband. Some nice new features, Keynote can be controlled via the iPhone / iPod touch using a new app that you can buy from the App Store. Pages has a full screen view, a bit like the edit mode in iPhoto, which makes full use of all screen area (I remember Mac OS 6 had this ‘feature’ built in, you could only run one app at a time!). There’s now linking between Pages and Numbers so data driven features in Pages can use Numbers as a source. Ok, so this is connected to the iWork suite but it’s a cool enough and notable feature I thought it was worth highlighting by itself, if for no other reason than to point out how dumb the iMovie in the cloud rumours were! iWork is initially a free beta but will eventually be a paid service (I think Apple learned a lot from the MobileMe launch! ), basically you can share iWork documents online and people can view them in the browser and comment on them or download the file to edit and make changes. Very similar to Google docs. As all the iWork and iLife apps only run on Leopard Apple have released the Mac Box Set which brings iWork, iLife and Mac OS X 10.5 in one pack for £149, that’s a pretty good deal. It’s interesting that there’s no mention of Snow Leopard here at all! The rumours were right of course, a non-removable battery! Now before you go complaining it’s for a very good reason. It supposedly provides 8 hours of charge and can be charged 1000 times (compared to 200 – 300 charge cycles on a regular battery). Other key specs are up to 8GB if RAM, 320GB HD by default with 256GB SSD drive as an option, also an optional non-glare screen! 2.93Ghz processor, 60% greater colour range on the screen. I’m sure it’s going to generate a lot of discussion due to the fixed battery but as it’s less than an inch thick it’s pretty impressive, especially if it can run for 8 hours driving all of that screen resolution! Available at the end of January for US $2799 or UK £1,949). All iTunes music will be DRM free by the end of this quarter! There is also new pricing ranging from $0.69 to $1.29. iTunes Music Store on iPhone / iPod touch can now be accessed via 3G network too. All songs will be in the 256k format too. Some interesting statistics they told were: 6 Billion songs sold, 10 Milion songs available, 75 Million iTunes accounts. I think the flexible pricing was what it took to get the DRM free music, it was definitely needed seeing as Amazon MP3 store has had a lot more DRM free music than iTunes for quite some time. I had 3 web pages open with liveblogging of the event when suddenly random messages, rude words etc kept creeping in and then it went completely pear-shaped! No Mac Mini, no iPhone Nano and no Snow Leopard demo! Two updates that didn’t appear though were a new Mac Mini and the fabled iPhone Nano. Now the iPhone nano I was dubious about anyway but the Mac Mini I was sure was going to get an update, perhaps they’ll do a soft-announcement soon? Also missing was a demo of the OS X 10.6 ‘Snow Leopard’, a lot of people expected to see a demo or at least get some hint of features or progress. I think the Mac Box Set kind of indicated that there wouldn’t be anything being released in the near future. Well, that’s my live-blog of live-blogging over, time to go check out the Apple website to read more about it all! Particularly interested in the Mac Box Set, though it'll render my remaining 3 of 5 licenses (from iLife '08) null and void.